At EcoEnclose, we live and breathe earth-friendly shipping solutions every day - but for the majority of our customers, choosing the right shipping solutions for their goods is an overwhelming task. After countless conversations with eco-minded businesses, we've come to understand that people really want some basic shipping guidelines. This is especially true as it relates to finding the best poly mailers for shipping clothes, soft goods and other products in a cost-effective *and eco-friendly* manner. If you've got questions about selecting the right poly mailer bags for your business, you're in the right place. We've helped thousands of businesses choose sustainable shipping solutions for their products. Read on for answers to the most popular questions we hear from customers on choosing poly mailers for shipping - without busting the budget. Already know Poly Mailers are right for your business? Order free samples of our poly shipping mailers to see our mailers and test sizes, or check out our 100% recycled mailer envelopes or 88% recycled poly mailers today. What is so great about poly mailers? What can I pack in poly mailers? What shouldn't I pack in poly mailers? When do I need lining, bubble or fill with my poly mailer? Should I consider bubble mailers? Can I custom print my poly mailers? How do I select the right poly mailer for my needs? How do I find the right size poly mailer? Are there environmentally friendly poly mailer options? Can poly mailers be reused? Can poly mailers be recycled? Poly mailers are light-weight, protective mailers made from a durable, moisture resistant polyethylene film (aka plastic). These plastic envelopes are thin, lightweight and weather-proof - so your goods will arrive at your customers' doorsteps in perfect condition. They come in many different sizes and dimensions, and are typically white or gray. You’ve probably received them in the mail, but here is a photo to jog your memory. We're shipping a polar fleece (mens, large) from a warehouse in Louisville, CO (zip code 80027) to New York, NY (zip code 10007), a shipping distance of 1,781 miles. While the shipping cost differences aren't massive, poly mailers still come out ahead! Obviously there are many different ways to ship, and weight is only one factor (read about dimensional weight here), so this is not to say that poly mailers would always save you money on inbound and outbound shipping, but often, it will. One particular situation where poly mailers can be beneficial for shipping costs is with USPS First Class Mail. First Class Mail is for envelopes and lightweight packages that are under 13 oz. Pricing starts at $0.49. Delivery timeline is one to three days. If you are shipping a lightweight product, poly mailers can keep your entire package under this 13 oz. limit, allowing you to utilize this cost effective shipping option. Poly mailers are ideal for clothing and other fabric-based goods, as well as yarns and patterns. They also work well for shoes and certain types of hats. We’ve seen them work well for boxed products that need to be shipped in another, outside layer (i.e. a shoebox, a small toy or a jewelry box). There are two main tests. First - is the product you're shipping fragile? If your answer is YES, and the product is fragile, then poly mailers are likely *not* the right solution for you. You probably want to go with corrugated boxes with cushioning and void fill or perhaps padded mailers. If the answer is SOMEWHAT, than poly mailers might work for you but you’d likely have to use protection and padding, such as packing paper, bubble, old newspapers or something similar. If the answer is NO, than poly mailers might be a good fit. Second – can the product properly fit in the poly mailer? The post office sorts and ships tons of packages daily, with a lot of machining and scanning involved in the process. A poorly filled poly mailer with flat spots can get caught in or misread by machinery. This can lead to errors, delays, damages or even returns to sender on the products you ship out. If your answer is YES (such as t-shirt that is folded to fit perfectly in a mailer) you are good to go. If your answer is NO (perhaps you are trying to fit a small jewelry box in a large mailer), you might want to consider other options including a better fitting poly mailer, an insert into your mailer to fill it out (such as void fill or a corrugated pad), or you may want to explore an alternate, better fitting or stiffer type of package such as a rigid mailer or padded mailer. We hesitate to give black and white answers as every product and company is different, but if you came here looking for us to make your decision for you, here is a handy checklist to show what poly mailers are and aren’t great for. If you see a check next to your product category, than at the very least poly mailers might be a good fit and are worth considering. Check out our product guide to see other shipping options for your goods and order samples if you want to test some ideas. A final note is that poly mailers don’t work great if you are packaging up several different types of items. In these situations, a box is typically recommended. 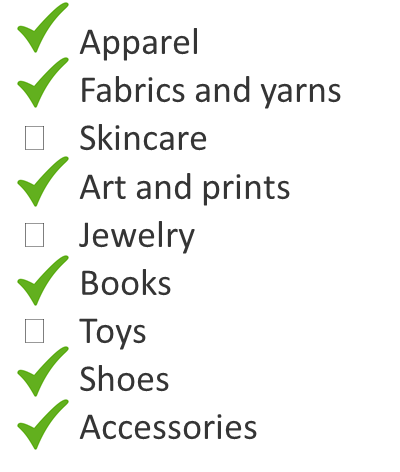 Again, check out our product guide to see how others package up multiple items together for a beautiful shipping experience. When do I need lining, bubble or void fill? Should I consider bubble mailers instead of poly shipping mailers? As described above, your item would ideally fill out poly mailers completely. Because of this, some businesses explore bubble mailers as an alternative option. What are bubble mailers? They are mailers lined with bubble padding (that looks like bubble wrap). In addition to providing a small amount of protection, the bubble lining causes these mailers to keep their shape, even when there are small items packed inside. Because of this, bubble mailers work with shipping systems even when they are not properly filled. EcoEnclose now offers a 32.6% Recycled, Fully Recyclable Poly Bubble Mailer for businesses that need a poly-based, cushioned, protective mailer for their products. We also offer an exceptional line of recycled padded mailers. These padded mailers make an excellent presentation, are made with 100% recycled (90% post consumer!) materials, can be recycled or composted, and provide a classy and eco conscious image for your brand. They can replace a bubble mailer in nearly all situations. Paper board mailers that can also be a great alternative for smaller apparel or other durable items. For fragile items, you can wrap the product with Greenwrap or packaging paper before placing it in a paper board mailers. Using lining or filling with your poly mailer envelopes can be a great strategy for some products. Some apparel companies that use poly mailers first put their products in clear poly bags (such as our flap & seals). This step provides some protection, and more formal presentation; however, it is generally not required. This approach does add cost to packaging and expands the amount of materials used. Books and similar items might benefit from being wrapped first with packing paper or newspaper, to give products some padding. Prints that are packaged in poly mailers are generally backed with custom cut cardboard sheets and are sometimes enclosed in clear poly bags first. If you need some recommendations or suggestions for your product, please call us any time. Yes you can! Custom printing is a great option if you're looking for designer poly mailers. If you need very large quantities of poly mailers most manufactures will offer pre-production printing services, meaning that the poly mailers are printed as they are being produced. However, many companies can't afford the cash nor space to order thousands and thousands of bags. Companies ordering in smaller quantities should consider “post production” printing. With post production printing, finished, blank polymailers are printed using a press (versus digital printing). This is an excellent choice for adding your logo or website to the poly mailer. Minimum quantities can starts at as little as 500. However, there are limitations. Typically post production can only produce single color designs while edge-to-edge printing and reverse-out designs are extremely challenging. Despite those limitations, we’ve seen beautiful poly mailer print jobs that promote companies’ brands and wow customers! Click here to learn more about EcoEnclose’s custom print service for our recycled poly mailers. We offer both small batch (post-production) and large batch (pre-production) services. There are a few things to keep in mind when selecting the right brand and style for your polymailer needs. Durability or strength: Unlike corrugated materials, where materials are labeled with ECT for "edge crush test" to clarify its strength, there are no universally accepted definitions of poly mailer strength. Characteristics that make a poly mailer stronger and more durable include its thickness, the number of layers used in the manufacturing process, and how the sides and bottom were sealed. As we have found with many things things in life, you get what you pay for. Lower cost mailers are often thinner and may have poor sealing or low quality adhesive. We know the abuse these mailers take in the UPS, FedEx and USPS systems; and we would suggest the extra few cents is worth the investment. Often the difference between quality and something else, is less than 0.1% of the shipment cost. Either way, we highly recommend ordering samples or starting small with any shipping supplies so you can touch and test them before you entrust them to protect your high quality products throughout their journey! Tear strip: A tear strip ensures your customer can easily open the bag, without having to mangle and poke holes in it to get what they ordered. Tear strips also make it easy for customers to reuse their bag once. Release liner: The release liner is the thing you peel off the adhesive on the bag. When you are packing up many orders at a time, you want this to be as seamless as possible and you want to avoid static filled liners that cling to you, to packages or to the floor! Bottom: Some poly mailers have "gusseted" bottoms and some (like ours) do not. We have found that most products don't need gusseted bottoms; however, very bulky items (such as thick quilts or shoe boxes) may benefit from this style. Dual peel and seal: More and more customers are seeking an online shopping experience in which returns are simple! Dual peel and seal bags have two adhesives - the first for when you pack your order and the second for your customer, if they need to return their item in this same bag. These "returnable bags" go a long way in helping to retain loyalty among customers who need to send back their goods for any reason. 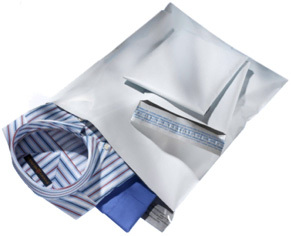 Tamper evident: All poly mailers are inherently "tamper evident" but those with strong adhesives that cannot be opened and then resealed ensure that your customer knows if someone tampered with their package between shipment and delivery. This helps ensure you can get to the bottom of issues such as missing or damaged items. Three characteristics - Size, Sustainability and Price - are so important that we've dedicated entire sections to each of them so read on for more information! Here's a handy recommended sizing chart to get you started, using the poly mailer sizes that EcoEnclose stocks. Other companies may carry different sizes, but this guidance should still be a helpful baseline. That said, this is not an exact science! As you can imagine, an extra small t-shirt versus a XXL may need different mailer sizes. You may find it helpful to order a sample first and ensure the size meets your needs! Sweater 12 x 15.5" or 14.5 x 19"
Two shirts 12 x 15.5"
Three shirts 12 x 15.5"
Fabric - 1 yd 10 x 13"
Fabric - 2 yds 12 x 15.5"
Fabric - 3 yds 14.5 x 19"
By definition, poly mailers are typically made of polyethylene – the most common plastic (which is used in primary in packaging and bags). Polyethylene is almost always made from oil and natural gas – two nonrenewable resources. But don’t despair! Before you write off poly mailers as environmental villains, we want to share a few things you should consider. First, the battle between paper and plastic is not black and white. While paper is made from renewable (and often, recycled) materials, plastic does have some advantages. Plastic is typically more energy efficient to produce and to recycle than paper. Plastic mailers are also lighter than their paper counterparts, so shipping is more energy efficient. So yes, you can be an eco-friendly business and decide to ship in poly mailers – and come to that decision thoughtfully! And if you have decided that poly mailers are the best shipping option for your business, there are environmentally responsible options for you! Recycled Poly Mailers: EcoEnclose has the only poly mailers on the market that are made with 100% recycled content. Yes, we know that other mailers advertise that they are made with “up to 50% recycled content.” These mailers are made by manufacturers using the scraps produced from their first run of poly mailers made with virgin content. Basically, it is the same as a cookie maker who cuts her first set of cookies from rolled out dough, then rolls the leftover back up to make the second batch – not really the same thing as “recycled content.” Our mailers are actually giving new life to material that has already been used and discarded. Our mailers are also recyclable. Depending on your curbside recycling program, they can either be recycled residentially, or at your local grocery store that accepts plastic bags (most of them do!). Biodegradable Poly Mailers: There are also biodegradable poly mailers available, typically made of ethanol produced from renewable resources (such as sugarcane or corn). Biodegradable polyethylene is a very exciting innovation in the materials industry. Thus far, EcoEnclose has decided not to focus on biodegradable poly mailers for a few reasons. The main reason is that we typically prioritize recycled content over virgin content whenever possible. We seek to first use materials that are already produced and in the supply chain whenever possible, and look for goods made with renewable resources as a second option when recycled content is not viable. The second is that the crops that are used for biodegradable polyethylene typically require a large amount of resources (including fossil fuels) to produce, and are often produced in ways that degrade water and soil. Finally, people are not consistently composting biodegradable polyethylene – either because they don’t know that they can or because they don’t have access to composting services. In a landfill, biodegradable goods are exactly the same as any other plastic, because landfills are designed to be air tight and prevent biodegradation. Again, we need to reiterate that we are very excited about innovations in biodegradable materials development and see a lot of possibility in this space! If you choose biodegradable options for your business – kudos for making such a thoughtful choice! We strongly encourage you to promote your choices to consumers and help ensure their bags are composted and do not end up in the landfill. As described above, poly mailers can typically be reused at least once when they have a tear strip, which allows recipients to open their packages easily (without having to mangle or poke holes in the bag to get their goods). If a bag has a second adhesive strip (as our 100% recycled poly mailers do), it is very easy for them to be reused. Even without a second adhesive strip, bags can typically be reused simply by folding them over and taping them down. Why would you reuse poly mailers? The first and most common scenario is for returns. Customers frequently order multiple items online with the intent to return some based on color, fit, style, etc. Making it very easy for them to do so will be a huge bonus for your brand and the customer experience. The second scenario is that eco and/or cost conscious customers may reuse their mailer the next time they have to send out a package. Showcase your commitment to minimizing waste by encouraging and making it easy for your customers to do so! Many poly mailers are fully recyclable. What does that mean? These are typically #4 (in the #1-#7 recycling labeling scheme) as they are made with Low Density Polyethylene (LDPE). These are considered "hard to recycle." Most residential recycling is "single stream." Our recycling bin contents end up at a sorting facility where bottles, plastics and metals get sorted in order to be processed and remade into new products. They are loaded onto a conveyer belt for manual and then automated sorting. Paper and cardboard are separated first through a dedicated machine. Metals are then separated out by a magnet, and then an Eddy current rotor machine. The plastic and glass then continue down the line to an optical scanning system which recognizes the plastic and blows it away. The heavier glass moves on down to the end of the line where it falls into bins designated for glass. LDPE, or #4 items, are lightweight and do not hold their shape. This leads them to get tangled up in the sorting machines, causing shut downs and damage. So these are manually removed and thrown out...bound for the landfill. The easiest way to recycle poly mailers and all plastic bags and film is to drop them off at stores and other dedicated facilities. To find a drop-off location near you, use the zip code locator at plasticfilmrecycling.org. We recommend dedicating a bucket to storing plastic bags and then, once it is full, bring it with you on your next grocery store trip. For more information on plastic bag and poly mailer recycling, visit PAC Worldwide's blog post on how to recycle poly mailers responsibly. As you can imagine…it depends. On quality and durability, size of mailer, quantity ordered, whether or not the mailer is reusable, where it is manufactured, and the type and environmental sustainability of material that is used. 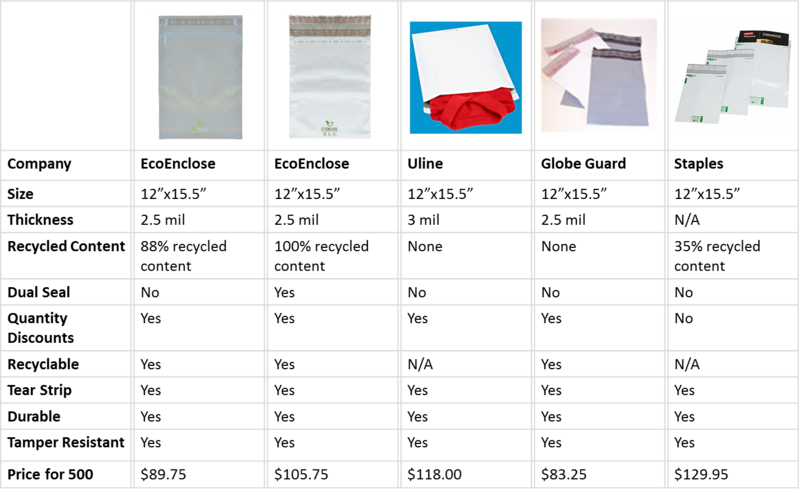 To provide a very basic starting point on pricing, the following is a comparison of five different 12"x15.5" poly mailer options available online. Looking for wholesale poly mailers? Many companies, including EcoEnclose, offer significant price discounts for high quantity orders. Contact us for a quote today. For what its worth, here are our two cents. While it may be tempting, don't skimp on your poly mailers (or on your shipping packaging in general). Buy quality packaging that will safely protect and deliver your goods. And we believe it is important to buy packaging that stands by and promotes your values and commitment to the environment. Let’s say you are shipping a product priced at $50, and you are debating between a 20 cent and 25 cent poly mailer. This differential is just 0.1% of the total price – a gap you may make up because you can minimize damages to your goods in transit and strengthen your brand and customer loyalty. In fact, we’ve found that eco-friendly packaging often inspires customers to post on social media – pretty powerful marketing for you and the environment!